This is my second visit in Rome and this time we hired a guide and a small bus to take us around. Being a non-catholic, I learned so much about Christianity. There are four major basilicas (a Roman Catholic church given ceremonial privileges) in Rome that you absolutely have to visit. 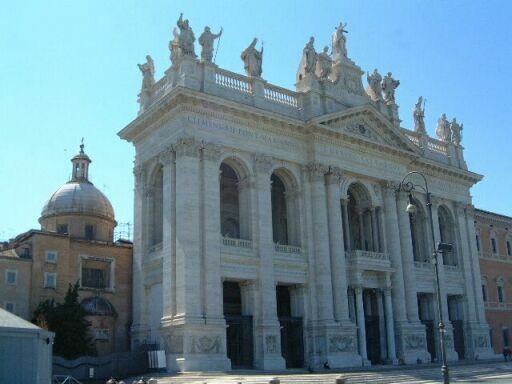 1- San Giovanni in Laterano (St. John in Lateran). Built during the reign of Emperor Constantine the Great, and renovated many times over the centuries, San Giovanni is the "Mother Church" in Christian history, and is the first of the four major Basilicas of Rome. 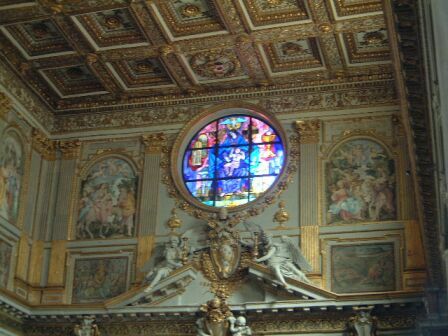 The Lateran Palace was the Papal residence for close to 1500 years and was the "Vatican" of the Middle Ages. The basilica still remains today as the Pope's titular church, and along with St. Peter's, St. Mary Major and St. Paul outside the Wall contains a "Porta Santa" (Holy Door) which is opened by the Pope to inaugurate a Holy Year. Across the street from San Giovanni in Laterano is the "Scale Santa" (Holy Stairs) which are said to be the stairs that Jesus descended after his trial before Pontius Pilate. On the bottom steps and the upper last two steps you can find a few drops of blood from Jesus (now enclosed in a circular see through glass). 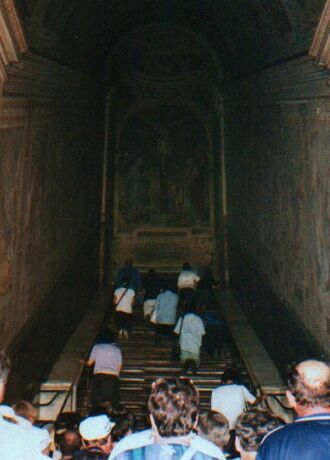 Here, during July of JUBILEE 2000, pilgrims climb the stairs on their knees saying the rosary, as is the tradition. Once at the top, they will exit from side stairs. According to legend, St. Helena, the mother of Emperor Constantine the Great, had her son bring the stairs back from Jerusalem to Rome when he built the Basilica of St. John in Lateran. The stairs lead to a small 4th Century chapel at the top known as the "Sanctum Sanctorum" (The Holy of Holies), which served as the Popes' private chapel during the Middle Ages. It was, in effect, the Sistine Chapel before the Sistine Chapel existed. My personal experience: when our guide told us that we can not walk up the stairs, we had to climb the stairs on our knees, I thought she was crazy and opted not to do so. But once there, I saw an old man with some physical disabilities climbing the steps on his knees with great pain but he has so much faith and conviction that I decided I should do the same. It was an ordeal, physically my knees almost gave up but I persevered. The hardest thing is having to stay on each step at least a few minutes before moving to the next step . Each passing minute was excruciating, I could feel the weight of my whole body on my knees, the rough surface of each steps rubbing against my raw skin. When I almost reached the last step in a moment of inspiration I bend down and kissed the spot where a few drops of Jesus' blood was now permanently inlaid. It was a triumphant moment! and I am not even a Catholic! 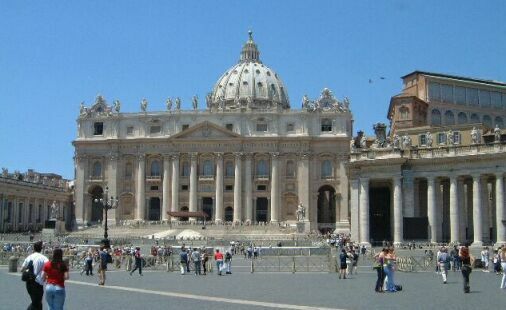 2- St. Peter's Basilica is the second major basilicas of Rome. It was built on the site of the original basilica erected by Constantine the Great over the spot where pilgrims and Roman Christians had traditionally venerated the remains of the first Apostle of Christ and first Bishop of Rome -- Simon Peter -- who was crucified upside down atop this spot on Vatican hill, according to tradition, under the Emperor Nero. By the beginning of the 16th Century, the first basilica was badly in need of repair, and so Pope Julius II della Rovere commissioned a new basilica that was finally completed in 1606 during the pontificate of Pope Paul V Borghese. Like all churches erected by Constantine, it faces the rising sun in the tradition of pagan temples. 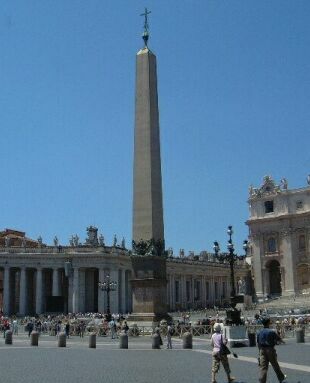 The square, with the Egyptian obelisk at center, along with the flanking colonnades, was designed and executed by Gian Lorenzo Bernini. 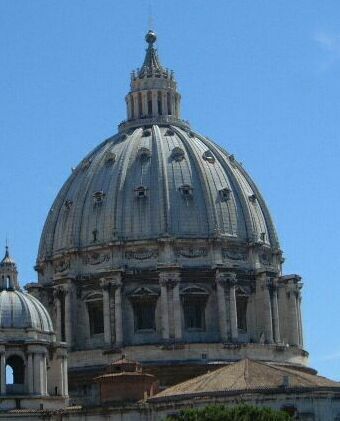 The dome, copied throughout the world atop buildings of state, was designed by Michelangelo and modeled on the dome of the Pantheon. 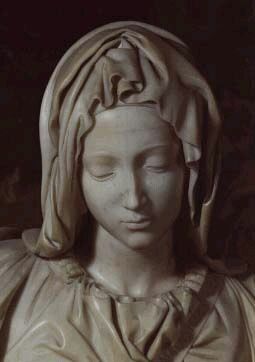 After Michelangelo's death, it was finally executed by Giacomo della Porta. The Altar and the Baldachin. 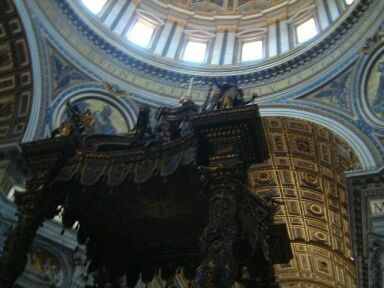 When you look at the altar (29 meters high) you can see the cupola (dome). This is huge dome measuring 71 meters in perimeter. Michelangelo worked on the construction of the dome from 1546 until his death in 1564. The work was finally done in 1590. It took 44 years to finish it. 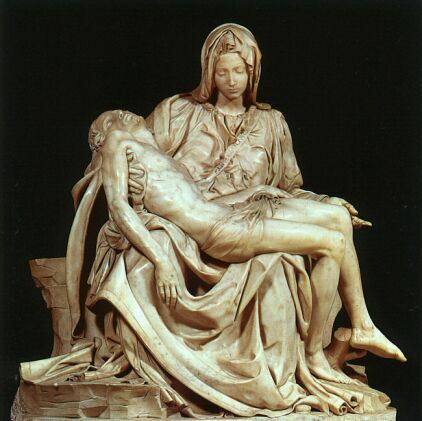 One of the most famous works of art, La Pieta , still in its original place in Saint Peter's Basilica, was probably finished before Michelangelo was 25 years old. The youthful Mary is shown seated majestically, holding the dead Christ across her lap, a theme borrowed from northern European art. Instead of revealing extreme grief, Mary is restrained, and her expression is one of resignation. 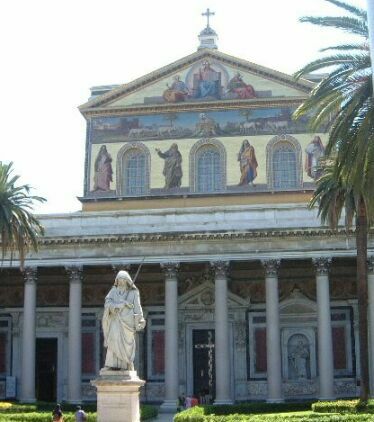 3- The third major basilica of Rome, San Paolo Fuori Le Mure (St. Paul outside the Walls). The "walls" refers to the Aurelian Wall, built by Marcus Aurelius in the 3rd Century as a bulwark against barbarian invasion. 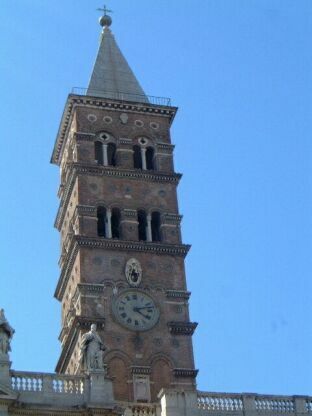 The place where the basilica is situated is called, "Tre Fontane" (The Three Fountains). Legend has it that three springs emerged from the spot where St. Paul's head hit the ground after he was beheaded during the First Great Persecution under the emperor Nero. The statue depicts St. Paul holding the sword with which he was beheaded. 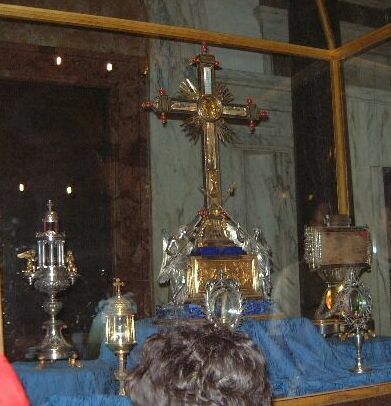 Inside the Basilica, mounted on the wall is the remaining of the cross when Jesus was crucified. Look at the cross, you'll see two small elongated swords (bottom of cross). The first one was the sword that pierced Jesus' heart and the second sword is the coup de grace (last blow) that was inflicted to the side of his body. You can also find the original nails (3 nails all together) that binds Jesus to the cross and are now stored in one of the container. 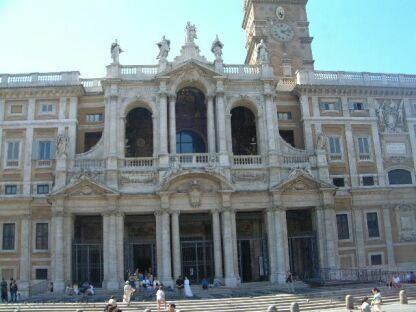 In the middle display, you'll find a piece of the original head piece that Jesus wore when he was crucified..
4- Here is the main facade of the ancient Basilica of Santa Maria Maggiore, the last of the four major basilicas of Rome. All of the monuments in Rome went through a new clean up process and was return to its original beauty without causing any harm or discoloration of the stone. Intricate ceiling adorned with beautiful design.